This list includes plants commonly grown as houseplants. The temperature given refers to night temperature. Daytime temperatures should be 10° to 15° higher. Suggested means for control of insects and diseases follow the plant list. AMARYLLIS Soil: 1/2 soil, 1/4 manure, 1/4 peat or leafmold. Temp: 65°. Light: full sun except light shade in summer for plants either outdoors or indoors. Bloom Requirements: failure to bloom due to poor growing conditions after previous flowering; during this time buds are formed in the bulb for next bloom; keep plants growing after flowering until late fall, when water should be withheld and plants allowed to die back; start into growth in January and feed regularly. Insects: mealy bugs, bulb flies. When maggots of bulb flies eat out the center of the bulb it is best to discard the bulb. Diseases: Virus disease causes red spots on leaves; remove and burn infected parts; generally not fatal. 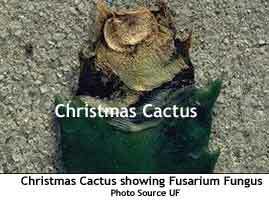 CHRISTMAS CACTUS Soil: 1/4 each: soil, sand, manure, leafmold. Temp: 65°. Light: full sun except for light shade in summer. Bloom Requirements: buds will not form when the night temperature is high, 70° to 75°; buds will not form except during short days, and an electric light near the plant in the evening is sufficient to prevent bud formation. Insects: mealy bug. Diseases: stem rot (avoid overwatering). More on Christmas Cactus care. COLEUS Soil: 1/2 soil, 1/4 sand, 1/4 peat or leafmold. Temp: 60°. Light: full sun. Growth Problems: leggy growth due to insufficient light; leaf drop due to poor light, dry air, or natu-ral causes on old woody plants. Insects: mealy bug. Diseases: blackleg. More on Coleus care. FOLIAGE PLANTS (including ivy, philodendron, crassula, dieffenbachia, dracaena, sansevieria, peperomia and others) Soil:’ 1/2 soil, 1/4 sand, 1/4 peat or leafmold. Temp: 65° to 70°. Light: will tolerate poor light but grow better in good light with protection from bright sun. Growth Problems: leaf margins turn brown when the atmosphere is too dry; spotting of foliage may result from too much sun. Insects: aphids, mealy bug, red spider mite, scale, springtails, slugs and snails. Diseases: stem rot. GLOXINIA Soil: 1/4 each of soil, sand, and peat or leafmold. Temp: 65°. Light: full light except protection from hot sun in late spring and summer Growth Problems: spindly growth indicates insufficient light coupled with too high a temperature; bud blast due to several factors such as overwatering. sudden temperature change, or too dry an atmosphere. In-sects: red spider mite, cyclamen mite. thrip, root nematode, slugs and snails, springtails. Diseases: stem rot, mildew, botrytis.